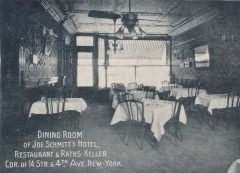 In midtown for many years (since 1937!) there has been a bar known as the Subway Inn, so named for its proximity to the underground complex at Lexington Avenue that plays host to the IRT 4, 5 and 6 trains as well as the BMT R, N and W trains. 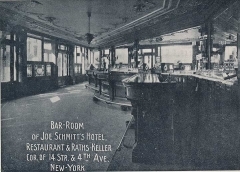 The bar lost its lease for its longtime location at Lexington avenue and East 60th Street in recent years, but fortunately, it was able to find a new location at 2nd Avenue and East 60th and moved lock, stock, taps and neon sign to the new location. 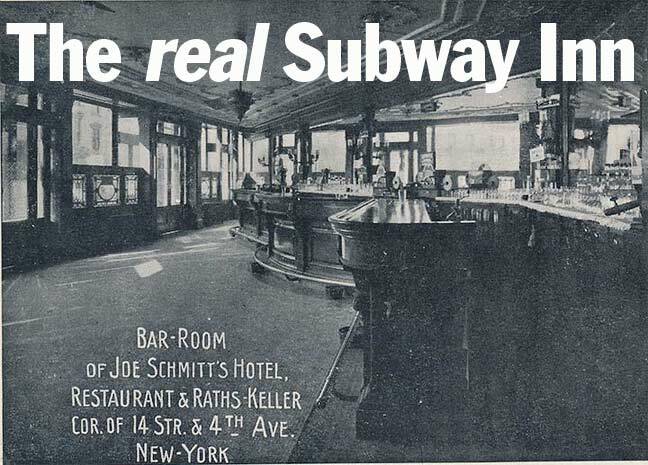 What if I told you…that there used to be an actual “subway inn” at Union Square whose doors opened directly onto a subway platform? It’s true. 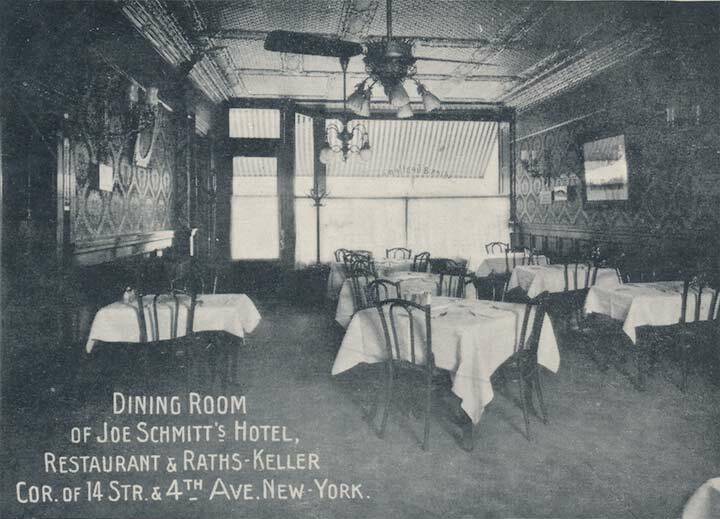 Joe Schmitt’s Rathskeller predated S.Klein, the “On the Square” retail institution at the northeast corner of 4th Avenue and East 14th Street. 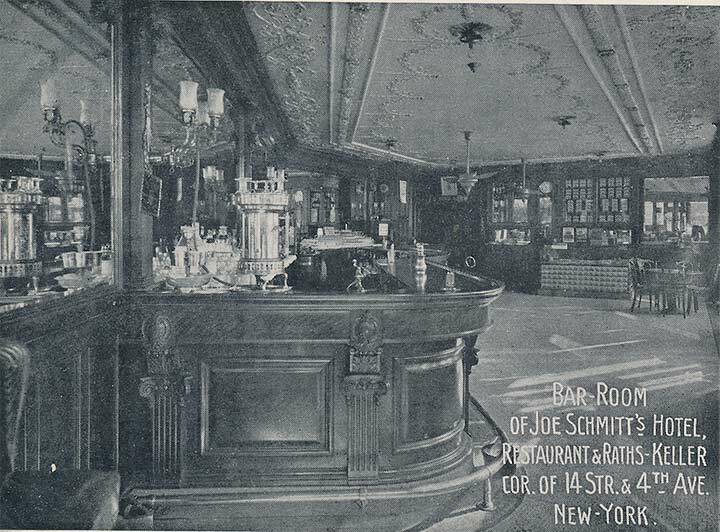 Some postcards I was working with at the Greater Astoria Historical Society alerted me to the unusual circumstance, which also leads to a discussion of the former infrastructure of the 14th Street IRT station serving 4, 5, and 6 trains. It’s an unusual station to begin with because it’s the only remaining station with mechanically operated sliding platforms, or “gap fillers” (after the ones at the old South Ferry station were retired a few years ago). 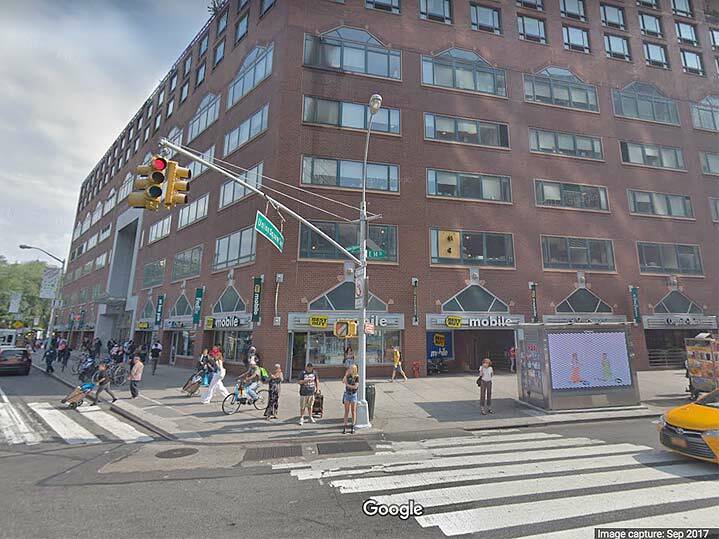 The station is built on a curve as 4th Avenue becomes Union Square East, then Park Avenue South, as it curves north, necessitating the gap fillers. 14th Street also has some ornamental remnants featuring terra cotta eagles, indicating the presence of a long-razed armory; early subway iconography used eagles to refer to armories. The real surprise was that the station also has side platforms unused since about 1910 that are now hidden behind the tiled exterior walls of the local tracks. 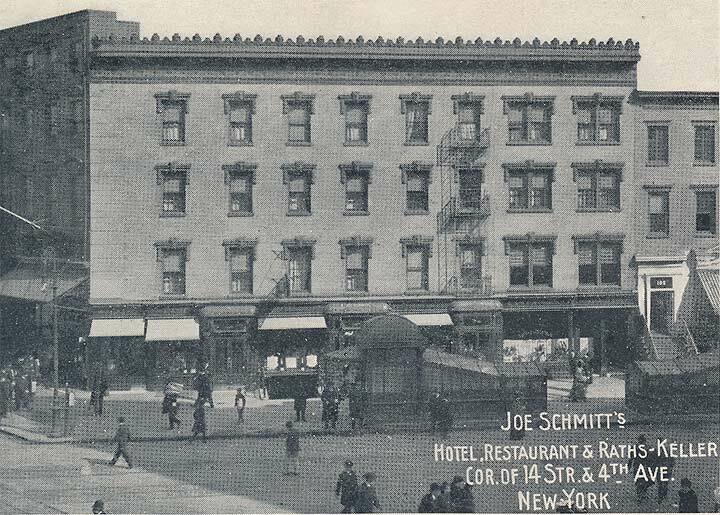 This postcard view from the early nineteen-aughts shows the building at the northeast corner of 14th and 4th, the entrance and exit kiosks of the IRT subway, and the exterior of Joe Schmitt’s Rathskeller. A view of S. Klein from the late 1980s from a bit further west on East 14th. 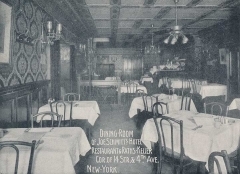 Samuel Klein founded the discount chain S. Klein in 1906, with the flagship store occupying the corner buildings at Union Square East and East 14th Street by 1912. The business eventually grew as large as 19 stores in the metropolitan area before the inevitable decline. 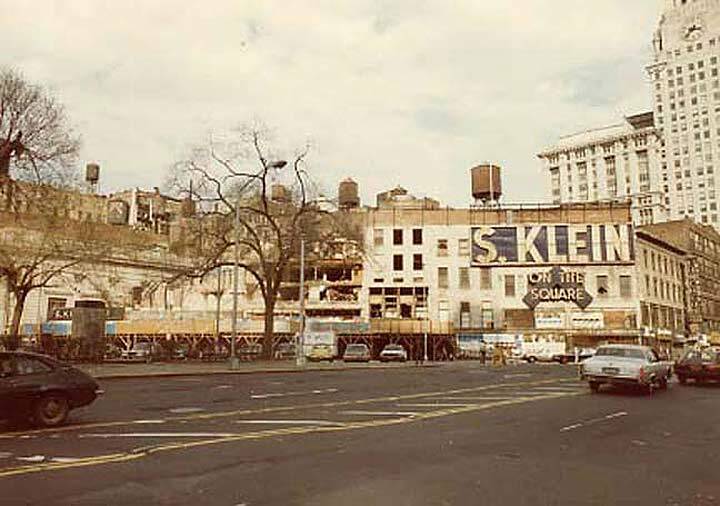 The Union Square flagship closed in 1975 (the space is currently filled by the 1987 Zeckendorf Towers apartment complex; the S.Klein Union Square building remained vacant for over ten years after the stores closed). 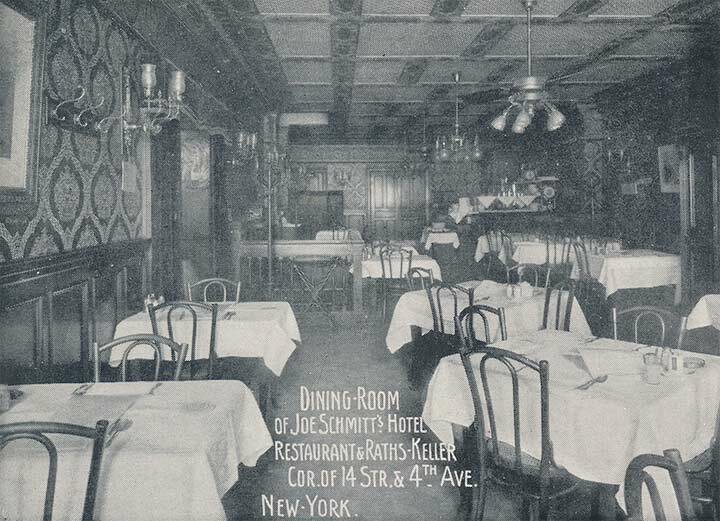 Samuel Klein maintained control until his death in 1942, and the Klein family sold the franchise in 1946 but retained the property. The company emblem was a measuring square–the catchphrase “on the square” was a play on the company’s flagship location at Union Square and its profession of fair business practices. One element remnants of S. Klein remains in NYC, in a doorway on Clinton Street in the Lower East Side marking a former branch. 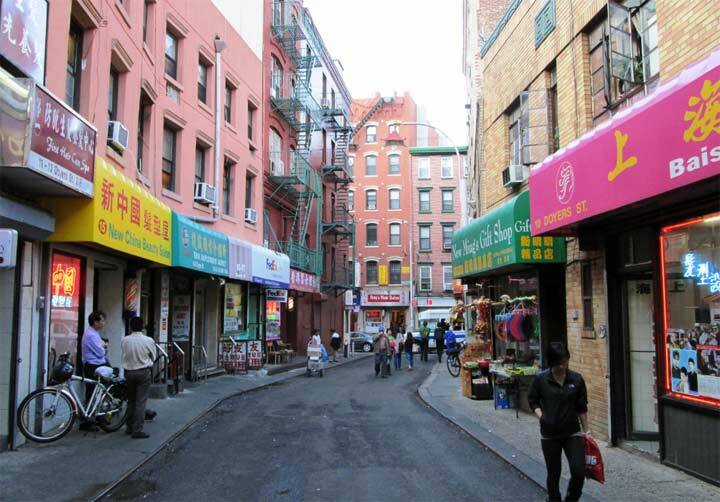 If you look closely at the above photo you can see that while the Union Square East side was altered somewhat the East 14th Street side still looks about the same. Zeckendorf Towers and retail businesses facing the street. The subway entrances were moved to staircases and escalators just under the facade. 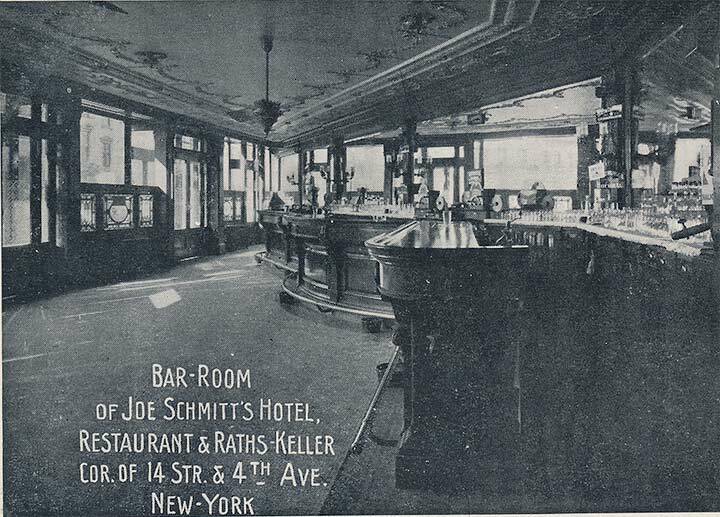 No doubt, Joe Scmitt’s Rathskeller was a classy joint, with several barrooms and dining rooms, and had a welcoming vibe with wood bars and wood wall paneling. Unfortunately I don’t know a thing about the place except from these postcard views. “Rathskeller” is derived from a German compound word meaning “council house cellar,” where drinking went on, no doubt; the word has nothing to do with rats in cellars. Nah. 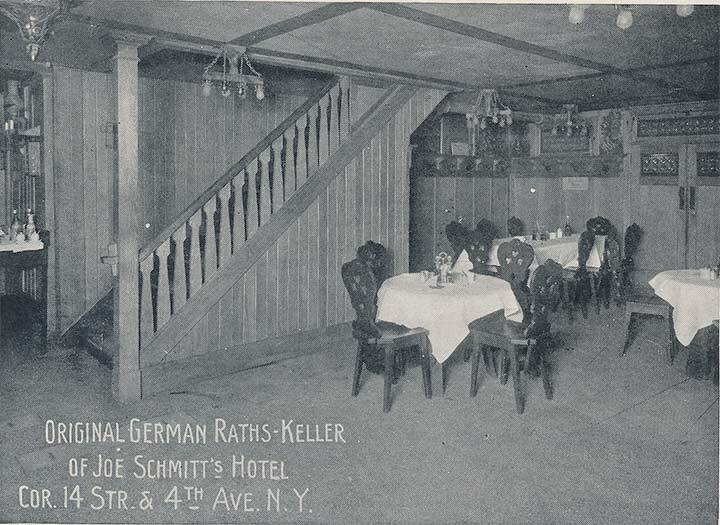 What interests me here is that Joe Schmitt’s had an entrance directly onto the side platform of what would be today’s uptown #6 local. 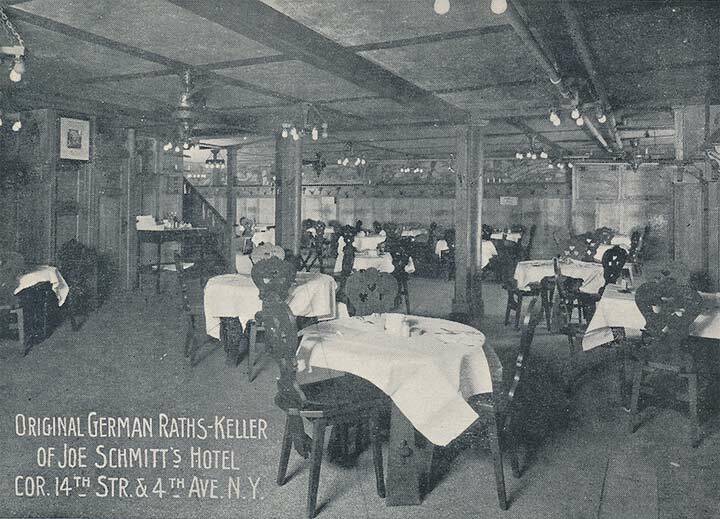 In fact, there was a terra cotta sign above the doorway advising riders that a RATHSKELLER was there, as well as the signage on the doors themselves. 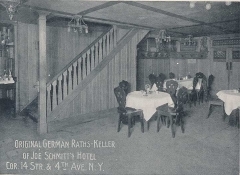 Here’s a view from within Schmitt’s, showing the “subway entrance.” The German phrase “eingang zur untergrundbahn” simply means the same thing. 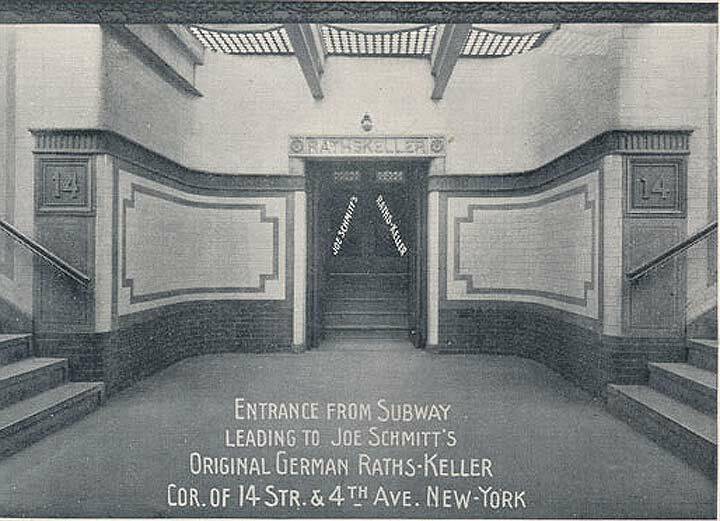 Did rathskeller patrons simply go onto the subway platform and board a train? Almost, but not quite. They had to purchase a ticket and hand it to a subway attendant by a gate, who placed it in a ticket chopper, and then they proceeded past the gate and the chopper onto the actual platform. Later, turnstiles were adopted that accepted the nickel fare. After 1948, fares began to rise every few years, and the turnstiles were adapted to accept tokens, which changed size or design when the fares went up. It turns out that the local side platforms at 14th Street were only in existence from 1904, when the station opened, to about 1910, when they were closed permanently. Joe Brennan explains in his Abandoned Stations post. The terra cotta eagles originally appeared on the side platforms; a few can be seen in the mezzanine connecting the IRT and BMT complex. 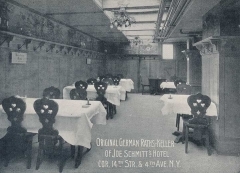 By 1912 Schmitt’s place would also bite the dust, as the S. Klein complex had its beginnings here. 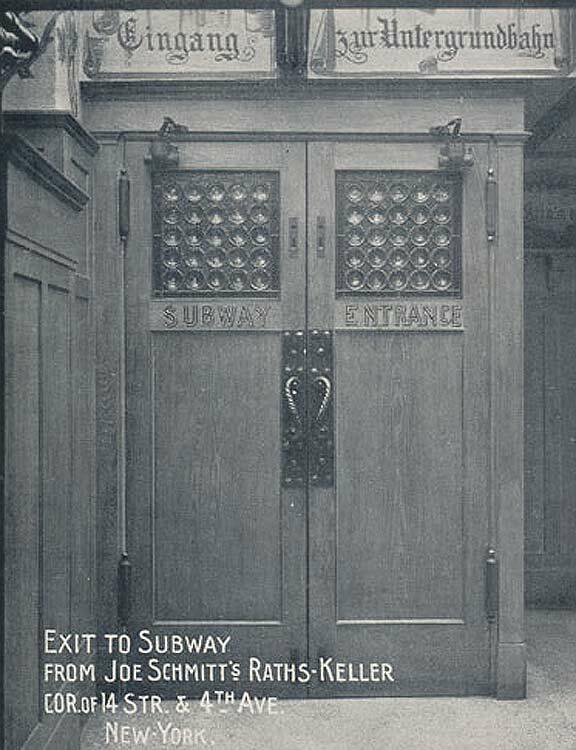 There’s another surviving unusual subway entrance to the Knickerbocker Hotel at the Times Square Shuttle platform! Curious as to whose clock tower is visible in the 80’s view of S. Klein? That’s the Consolidated Edison Tower, the corner of Third Avenue and 14th Street. Their parking lot is on 3rd ave. I think the Knickerbocker sign has been modeled over. Was looking for it and didn’t see it last time in the station. Sure hope I’m wrong! Knickerbocker sign is on the old route (East Side Shuttle) at Times Sq.